My New Year's resolutions are going to be magically simple. For example, I have plenty of things I'm going to do next year, and it would be tempting to put them into the mix as a resolution, but I'm going to do them anyway, so that would be cheating. I'm currently an eBay Premium Seller. This means that eBay push you as a seller with a 100% record and I sell a lot of magic through the site. The way to become a premium seller is just to do everything you say you will and to sell excellent merchandise, which I do. If I get a complaint, I deal with it. If someone isn't happy with a product, I refund or replace it. 99% of my customers are sincere and the problematic 1% aren't hugely important. Very occasionally, I get a customer that's is trying to pull a fast one and if I think that then - and some people are surprised at this - I refund them so that I get positive feedback, then block them from ever buying from me again. 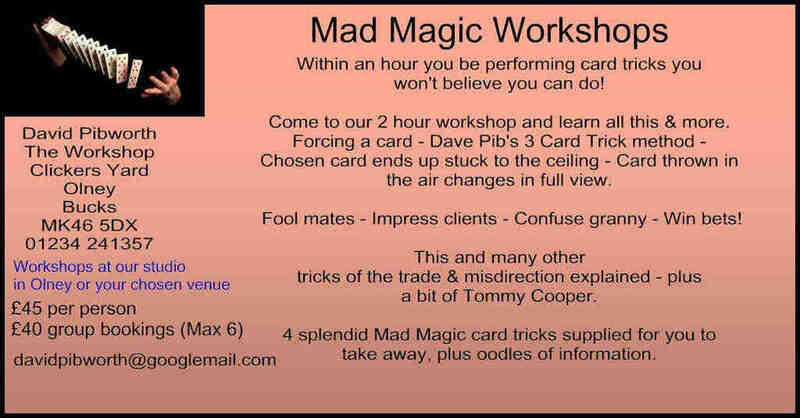 I'm probably quite lucky as my customers tend to be magicians or at least hobby magicians, and what I sell is top notch and tried and tested by me, so I know exactly what I'm selling. What I'm trying to do next year is to get customers as trusting with my own website, but it's more difficult as there is no eBay to go back to if there is a complaint. As people haven't got that guarantee, I'm working hard on ways to get customers signed up for it, and it's not that easy. "Which is why I've put it on my new year resolution list because it would be easy just to keep pushing it aside." But in January, I shall be re-filming all my tricks and photographing all my goods and pushing it through social media, and well, let's see how it goes. So if you want to amaze your friends and work colleagues, do keep an eye on my website which you can find at www.magicandmore.co.uk. Happy Christmas to you all and see you again in 2018.